DEAR JOANNE: The freeze or frost line is the depth to which the soil freezes or has been known to freeze at some point in the past. It is absolutely critical that the foundations of buildings extend below this point in a soil profile. Except for a few arid locations, soils typically contain water and this water expands approximately nine percent in volume when it freezes. The resulting pressure created as the water expands is so great it can actually lift concrete slabs, house foundations and deck structures with as little effort as an Olympic weight lifter expends picking up his gym bag as he leaves the locker room. The frost line depth is not consistent around the nation because there is such a dramatic difference in climate from state to state. The frost line in southern Florida is less than a foot, while in northern Minnesota it approaches 6 feet. The best source of information regarding your frost line depth is your local building department. These individuals perform daily inspections on jobs such as yours to ensure two things: the hole is the proper depth and the soil at the bottom of the hole is strong enough to support the concentrated loads being placed upon it. 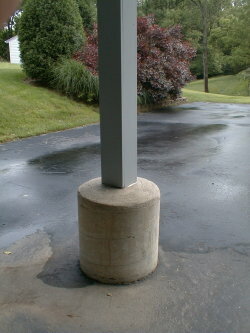 The diameter of the holes for your deck piers is not a number pulled out of the air. You may get the answer from your building inspector or you may have to consult with a seasoned architect or structural engineer. Decks, especially large ones, create significant concentrated loads within the soil. If you calculate the weight of the entire deck, the furniture placed on it and the combined weight of a large group of people who might be standing on it, you will be shocked at the number. Even a small deck might weigh in at 12,000 or more pounds. If your deck is like most where it has two wooden deck posts and a rim joist that is bolted to the house, each of the two deck post holds up approximately 25 percent of the total weight. 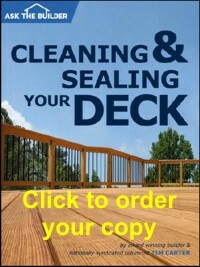 In your case, the soil under each deck post may be called upon to support 3,000 or more pounds without flinching. The diameter of the hole will probably be no larger than 24 inches in diameter and may be as small as 12 inches. Larger diameter holes spread the weight out over more soil area. What is perhaps far more important is the shape of the hole as you dig it. All too often people dig post holes for deck piers and fence posts that look like an ice cream cone - the bottom of the hole being smaller than the top of the hole. In fact, the shape should be the exact opposite. The bottom 25 percent of the pier hole should be larger than the top. As the frost drives deeper into the soil and tries to force the pier upwards, the flared base acts like the head of a screw or nail. For the pier to lift upwards the enlarged base would have to tear through the frozen soil. This is highly unlikely. The larger diameter base also helps spread the concentrated load over an even greater area. Be sure to include two or three pieces of vertical reinforcing steel in the concrete as you pour the pier. This low-cost item adds enormous strength to piers that are taller than 30 inches. Long concrete piers poured on hillsides are subject to lateral or sideways soil pressure as the soil creeps downhill over time. The steel will help prevent the pier from cracking in two from this pressure. If you want your wooden deck posts to be dead center in the middle of the concrete pier, then you need to be an expert surveyor or a person who builds deck like I do. Centering the deck posts is easy if you have the outline of the deck built and suspended in the air. This is very simple to do. Start by attaching the rim joist to the house. Attach the two end joists of the deck to the rim joist using joist hangers. Temporarily support the other end of the joists with a piece of lumber making sure the joists are level. Nail the outer joist to the ends of the two joists that extend from the house. The outline of the deck is now complete. Check to ensure the deck outline box is both level and square. Once the deck outline is square, drop a plumb bob from the corners to establish these points down at ground level. Use these reference points to easily locate the proper pier locations. Good day. My builder installed three large pilons/piers for me, however they are level with my rough grade and I would like them to be well above [6"] my final grade. I've thought of drilling in a few short pieces of rebar and then simple capping off each pier to build it up the additional height. Any suggestions ? I had no idea that decks can put so much weight on piers. The fact that a small deck can put more than 12,000 pounds into the soil is something that makes the need for correct design and engineering even more apparent. A lot of times, that's something that you don't really think about, but there's a lot of things like this that can make a big difference. Thanks for sharing!